2017 has been a truly amazing year for the Priority One Armada and our KDF fleets The House of Martok and The House of Mogh. We have increased our Federation Armada level from approximately level 280 to over level 400 throughout 2017. Both Gamma fleet and Delta fleet have reached Tier 4 and are now well on their way to becoming Tier 5 Starbases. Epsilon fleet was able to go from Tier 4 Starbase to fully upgraded Tier 5 Starbase this year too. Just a few months ago we also brought a brand new KDF fleet online due to the incredible loyalty, dedication and demand from every member of the Armada. The House of Mogh has been extremely well received by all members and is progressing very nicely. In just a few short months since it was brought online it has increased from level 30 to level 45 at the time of this mail. Back in May of this year we started up the Priority One Armada Weekly Twitch Streams again. As you no doubt know, we broadcast every Saturday and often give away some amazing prizes. To date we have given away over 1 Billion EC in prizes. 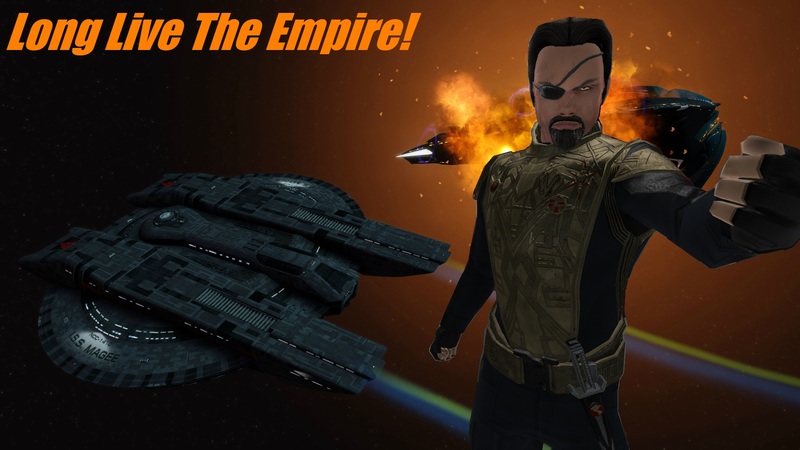 During these Twitch Streams we discuss the latest news for STO and the Armada and once we have finished, we move on to our “Weekly Away Mission”. During this segment we team up with you, the viewers and play content to earn all types of Reputation Marks and Dilithium. This is extremely popular as it is a regularly scheduled event. Of course none of this would be possible if it were not for our Hosts, so I would like to say a very sincere thank you to Adm Cat, Adm Rikers, Adm Hunter, our guest hosts Cmdr Andy and Cpt Alex and of course to the shows Producer, Adm James! In June of this year we celebrated our 4th Year Anniversary and it was the biggest event that we have ever done. Throughout the whole month of June we done multiple daily giveaways and each weekend we had a major event planned such as the popular Where’s Winters, The Risian 500 and more. This year we gave away more than 2 Billion EC worth of prizes during our Anniversary. Again, none of this would be possible without the incredible generosity of Armada members such as, Capt Bosh, Capt Shane, Capt Theevat, Capt Ben, VA Matok, Adm Cat, Adm James, Adm Rikers and Adm Hunter. 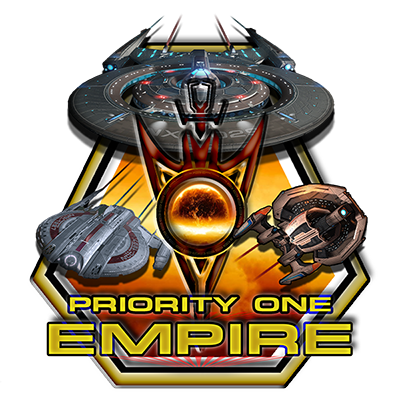 A few weeks ago we announced a new fleet on the Federation faction called “Priority One-Ferengi Alliance. This fleet was brought online as a perk for members who had shown loyalty and dedication to the Armada and earned the fleet rank of Captain in any of our fleets. Membership is restricted to Ferengi characters only but there are several benefits for being a member of the Ferengi Alliance. Some of these benefits are complete and full access to all fleet stores from the first rank. The promotion requirements for this fleet are between 25% to 30% less compared to all other Priority One fleets. I would like to say thank you to Adm James for all of his assistance in creating the rules, awards and procedures for this fleet as we put a lot of work into it. Again, just a few weeks ago we announced the opening of the “Priority One Armada Online Store”. This was something that many members asked us to create and I am happy to say that everyone seems to be very happy with the store. There is a wide range of things that can be purchased from this store ranging from Mugs to Mouse Pads, T-Shirts to Hoodies and much more. Please see the Armada website for a link to this store. Then at the end of this year we started another huge Holiday Giveaway. Everyday for the whole month of December we have been giving away stacks of Superior Tech Upgrades multiple times everyday. We had 1,000 Superior Tech Upgrades to giveaway and this was thanks to every member of the Senior Staff who donated all of them. I would also like to thank Cpt Alex and VA Sean who have been carrying out this event and giving away these Tech Upgrades to members of the Armada. Finally, I would like to say a huge and sincere thank you to all of you, the members of the Priority One Armada. Because it is all of you that have helped to make this the community that it is. I am always so proud when I see members helping each other, or welcoming a new member to the Armada. To date we have approx 2,500 characters spread across all of our fleets and we continue to grow each day. So, I would like to wish each and every one of you a wonderful holiday season and I look forward to seeing you all in the new year. January 29th 2018 I started playing Star Trek online. After joining a few fleets on February 12th 2018 I found Priority One Armada, I found the fleet by looking amongst all fleets was looking for a fleet that had TeamSpeak or a voice server that you can talk to Other players. It only took me 3 months to reach the rank of Captain in the Armada. I also found out the Armada had a twitch show which I joined and watched the show for a couple months. And now I am a host on that twitch show..I can tell you a time that I was on TeamSpeak and don't remember the person's name but they gave me a ship a T6 ship and I was brand new on that TeamSpeak server and he Armada. I cannot thank the people enough that helped me build my ship that took the time explain things to me. Priority One Armada is just not a group of people that play a game, they are a Brotherhood WE are a family WE are a community of Gamers that love Star Trek online. In the six months that I have been in the Priority One Armada I have made some great friends. The friends that I have made amongst Priority One Armada, Can make your day!!! There are days that I cannot wait to get home if I'm out running errands to jump on the TeamSpeak to hang out with my friends. So if you're looking to find a great Armada, please check out Priority One Armada!!! Today we want to highlight a few members who have gone above and beyond the call of duty for the Priority One Armada. These members have been unanimously nominated by the Senior Staff for the “Outstanding Service Medal” in recognition of their recent real world money donations to the Armada website and Dilithium donations made to each of their home fleets. We all felt that their generous contributions warranted special recognition within the Armada, since their efforts have made a huge dent in what we owe for website hosting fees, domain name fees, TeamSpeak hosting fees and other Armada administrative fees needed to maintain our Armada network. It is my great honor to present the “Outstanding Service Medal” to Capt [email protected] of Priority One-Gamma Fleet, Vice Admiral [email protected] of Priority One-Alpha Fleet, Vice Admiral Sean [email protected] of Priority One-Alpha Fleet, Admiral [email protected] of Priority One-Alpha Fleet, Capt [email protected]#3534 of Priority One-Gamma Fleet, and Capt Tor'[email protected] of Priority One-Gamma Fleet. This is an extraordinary accomplishment and each of you have become part of a very distinguished group within our community and we are so grateful for your generosity and dedication to the Armada. Your new award can be viewed on your website profile and will also appear in any forum posts you create. For more information and a complete list of available awards please visit the Armada website. Yes of course @ethridge, just let me know what your full "[email protected]" is as well as what your "Faction" is and I will send the invite. I look forward to hearing from you! Priority One is an amazing fleet. I joined about 6 months ago and I can now say they are my family, and my best friends. It is a community of wonderful, friendly, caring people. We all help each other out in so many ways. P1 is a very active fleet. I have been on at all times of the day and night and there is always people talking in the game chat and in our voice chat. I worked very hard and I am part of the senior staff now. Being leadership in a fleet in STO was never appealing to me until I met P1. We have a full armada of Federation fleets and a full armada of KDF fleets. We also have some special fun fleets you can join once you have become a captain in a regular P1 fleet. My favorite is the live stream every Saturday night on twitch. (Starting back up on January 5th.) We just did a 12 hour live stream that was so much fun, I will never forget it! We have lots of events, giveaways and so much more that I can't list it all here. I am so glad that I found Priority One and became a part of this wonderful community! Thanks for your time but I found another fleet. Thank you! Hi I only started to play the game a week ago and have somehow stumbled my way to level 39. I can say that I really don't know what I am doing half the time and the other half has just been shear luck. So with this in mind I decided to look into joining a fleet and guess what yours so far as come out on top. Just a couple of questions well 1 really does it matter that I do not use Team-speak or Discord as I don't have a mike so cannot do voice chat also I don't really use the in game chat box. Reason being as an older gamer I find it hard to concentrate on more then one thing at a time (and I would rather save my ship and crew then chat to other player most of the time). Don't get me wrong I will use in game chat if I am in a safe area. So would this be a problem to me joining your fleet. In regards to your question, no it doesn't matter matter at all. We are a very casual and laid back community. One of our core beliefs is that nobody is forced to do anything they don't want to. If that means that they don't want to socialize or take part in any of our events and just play solo, that is totally fine. If it means that they want to help out with the day to day running of the community, that is fine too. I tried to send a fleet invite to your character that you listed but I keep on getting the error that the "character does not exist". If you could please confirm the full and correct "[email protected]" and let me know I will send the fleet invite to you again. If you have any other questions or I can help you with anything, please let me know and I would be happy to answer them for you. Anyway, I'll say welcome to the community and I look forward to seeing you in game! Added two characters to sign up if that's alright? I just wanted to apologize to you for saying that you left out the "Keith" part of your "[email protected]". When I came back here and looked after I sent you the fleet invite, I realized that it was indeed me, that made a mistake. For whatever reason, I simply didn't notice the "Keith" part that you obviously "did" include. I am very sorry! Thanks a million for signing up. Of course there is no problem with adding multiple characters. Everyone is welcome to bring as many toons into the armada as they want. Since we have so many fleets, room is not a problem for us. Anyway, welcome to the community and I look forward to seeing you in game! Hey, thanks for the invites, I have a problem though, I contributed on both to get them the first promotion and the human character got promoted but my Andorian isn't a member any more... do we know what happened/can I rejoin at all? I went back and looked over the logs and it seems that you left the Alpha fleet last Sunday. I have sent an invite to your character again so you should get it the next time you login on that toon. I will keep an eye out for you and put your character back at it's proper rank once you get back into the Alpha fleet. > I just wanted to apologize to you for saying that you left out the "Keith" part of your "[email protected]". When I came back here and looked after I sent you the fleet invite, I realized that it was indeed me, that made a mistake. For whatever reason, I simply didn't notice the "Keith" part that you obviously "did" include. I am very sorry! > Added two characters to sign up if that's alright? > Thanks a million for signing up. Of course there is no problem with adding multiple characters. Everyone is welcome to bring as many toons into the armada as they want. Since we have so many fleets, room is not a problem for us. Anyway, welcome to the community and I look forward to seeing you in game! > Hey, thanks for the invites, I have a problem though, I contributed on both to get them the first promotion and the human character got promoted but my Andorian isn't a member any more... do we know what happened/can I rejoin at all? > I went back and looked over the logs and it seems that you left the Alpha fleet last Sunday. I have sent an invite to your character again so you should get it the next time you login on that toon. I will keep an eye out for you and put your character back at it's proper rank once you get back into the Alpha fleet. I don't know what happened, i logged in and wasn't a member anymore, strange one. PS4 (65) Rom/kdf with elachi shesar and fleet faeht. I’m looking for a permanent home with other Friendly, Mature & helpful members. I have alot more to learn about the game and I believe that I would get the most out of my game with your Armada. I tried messaging a couple of members in the PS4 Fleet but didnt get a response, figured were afk and missed them. If you're interested in joining our community you can submit an application on our website. Be sure to include which platform you play on, the faction of your character/s as well as their full and correct "[email protected]". If you have any questions, please let me know and I will be happy to answer them for you. If you wouldn't mind submitting an application on our website in order to join our PS4 fleet. Unfortunately I play on PC and therefore I am unable to send you a fleet invite. If you do submit an application the PS4 guys will see it and be able to send you the fleet invite. The form is pretty straight forward and you shouldn't have any problems. I'll let the PS4 guys know to expect an application from ya so that we can sort it out for you as quickly as possible. Priority One is only 2 weeks away from Priority One Empire Month. We will be thrown into the Mirror Universe, where we will have to take on the role of our Mirror Persona. I can't wait to see what adventures await us! It's officially Priority One Empire month.